Round the banks of Lake Louise." 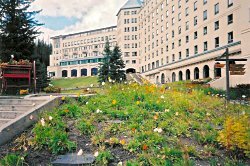 The first time I visited Lake Louise I ignored chateau, mountains and lake till I'd found the poppies and seen for myself that the words of that old song, which resounded through my childhood, were true. Song create pictures which influence us much more than we realize, In fact, I believe my family's out here because of songs, stories and poems glorifying life in the west. Songs such as "Blue Canadian Rockies", and "Springtime In The Rockies" lured my father westward from long-settled Ontario. Some pioneers were drawn by the promise of land, some by gold. Some came for the thrill of the mountains, others left behind painful memories. Father came for adventure. Oh, he prospected and eventually homesteaded, but, unlike more serious settlers, he also climbed mountains and explored wild valleys. Why would a man leave a comfortable life in Ontario and a steady job in a bank for the hardships and uncertainties of the west? Father was a reader and a romantic. Tales of that great, lone land promised the freedom and excitement of making a new life, unrestricted by staid old ways. Novels of G.A. Henty and Zane Gray described a country where courageous, principled, young men stood fast against evil; finally foiling the claim jumper or cattle rustler, and, of course, getting the girl. Gray's "Riders Of The Purple Sage" probably did as much to attract Father to the west as any hope of gold. Finally he could resist no longer. He set off to see the Rockies for himself. He probably went humming a song. In that era music was everywhere, from the tavern to the theatre. There were private musical evenings and public performances. A young lady's musical accomplishments enhanced her chances of a good marriage. 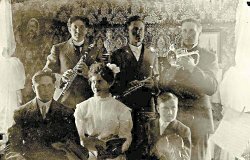 Some talented families, such as the Vicks of North Dakota's KV Ranch, formed their own family band. When Amanda Vick moved north to Alberta to marry rancher and cattle buyer Charlie Scheltens, she brought not only her piano but the bust of Beethoven which stood on it. Amanda might leave her country behind but she was not going to leave her music. What songs they had! "Down In The Valley", "Seeing Nellie Home", "Shine On, Harvest Moon". As cattle became established on the great central plains, drives and cowboys crossed the border bringing their songs. "Git Along Little Doggies" and "Bury Me Not On The Lone Prairie" rang through Canadian cow camps. A coyote's howl was a coyote's howl, after all, on either side of the line. "The Strawberry Roan" described a mean bucking horse familiar to cowboys of any country. "Home On The Range" became the anthem of North American cowboys, and of those who just wanted to be. Written as a poem in 1873 by Dr. Brewster Higley of Smith Centre, Kansas, it was slightly altered by John Lomax when he added it to his collection of western poems in 1908. By 1925 it was widely known and, in 1933, it was the most popular song on Canadian radio. Gradually the western songs filtered back east along the trails. Ontario parlours echoed to the unfamiliar strains of "My Alberta Rose", "My Home By The Fraser", "Walking The Streets Of Calgary", "Rocky Mountain Moon", even "When The Ice-worm Nests Again". Father'd never seen an ice-worm, but he could remedy that. 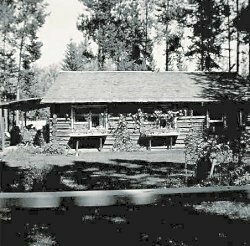 And, "My Little Log Home In The West" offered a challenge to a man living in his family's one hundred year old brick house. "The West, A Nest And You, Dear" sounded like ultimate happiness. He decided to go west. But, he didn't get there all at once. For several years he went on the harvest excursions: train-loads of young men who headed to the prairies in early fall to help bring in the harvest then returned to Ontario, their pockets full of money and their heads full of stories. At that time the Canadian west so captured people's imaginations that one of the greatest poems, "The Red River Voyageur", about the Catholic mission at St. Boniface, Manitoba, was written by New England poet John Greenleaf Whittier, who never saw either the Red River or Manitoba. He was inspired by a newspaper account. Yet his poem so effectively caught the spirit of weary voyageurs canoeing home that, when he died, the bells of St. Boniface were tolled in his memory. With the drifting cloud-rack joins…." And the smoke of far-off prairie fires." And, beyond St. Boniface? Eight hundred miles of prairie, then the Rocky Mountain foothills. Pauline Johnson loved the mountains, too. Naught but the starlight lies 'twixt heaven and him. Sing themselves through his dreams in cadence sweet." Father just had to camp on that alpine meadow, wherever it was. One autumn he didn't return to Ontario after the harvest. Instead he stayed in Alberta and got a job, in a bank in Cardston, right along those famous Rockies. He was happy there, for a while. But, Cardston was fairly civilized, too much like Ontario. Besides, he'd heard about other mountain ranges. And, by now, he had a gold-pan. He wandered further west until he found the isolated valley near Mt. Robson where he homesteaded, built his log cabin, enticed his sweetheart from Manitoba to join him, raised his family, and lived the rest of his life. Father always had a flair for the dramatic. During our childhood that log cabin echoed to "The Shooting Of Dan McGrew". Many a night we were tucked into bed and lulled to sleep by Father reciting "The Cremation Of Sam McGee". And I want to go back- and I will." Father made a few trips 'back East'. In fact from 1941 to 1947 he worked in an aircraft factory in Kingston manufacturing bombers for the Second World War. But, as soon as he could, after the war, he quit the job, packed up his family, and left the broad, maple-lined avenues of Kingston for the pine and spruce forests of B.C. and that winding trail which led to his cabin. It puzzled the Ontario relatives. In 1967 on a visit to them, I was asked by a wistful aunt if 'dear George' would ever come home again. Gently I replied "No. He was lost long ago to the lure of the West."